Ships from and sold by Kuyou Sport. Enhanced version, premium durable canvas fabric. 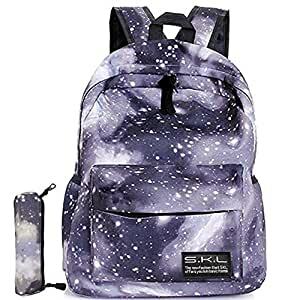 Durable lightweight backpack: high quality soft material (Polyester); smooth zippers; stain resistant; perfect size; ideal for service as book bag, rucksack schoolbag, casual daypack for daily use at school, weekend getaway. Comfy. Lightweight construction for easy carrying. The top grab handle offers quick grab-and-go mobility. Padded back panel ensure cushioning comfort. Ergonomic adjustable, padded shoulder straps keep the pressure off. Very Practical for your laptop, umbrella, books, stationary, lunch, wallet etc. Perfect gift for teen girls, back to school accessories. When pull the zip, close both side first, please hold the end of the zip with left hand, then pull zip with right hand. If the zip is a little loose, you can be patiently tight it with pliers, and it is also a useful way to maintain the zips in daily life. If you have other problem during using, welcome to contact us first, we will provide good customer service and be responsible for all defective products. The backpack is roomy enough to store most of your school / daily necessities such as textbooks, binders, spiral notebooks, a calculator, pens and pencils, a lunch bag case, small coat or shirts, cell phone, cards, portable chargers, MP3 player and a laptop / tablet with 14.1''. Please leave the backpack in freely circulating air for 2-3 days to lessen the smell of fabric. Loading weight beyond the max capacity will reduce of service life. We are concentrated on providing you best products and customer service. Please contact with us with no hesitation if you need any help from us.